Warren Buffett’s favorite stock market valuation metric, when using the broadest measure of total stock market capitalization vs. the total value of US GDP, is at an all-time high. As in, as measured by the broadest, most-inclusive data, the US stock market has never been as expensive as it is right now. Using the Wilshire 5000, which includes the market cap of the vast majority of all publicly traded US stocks, is a more accurate barometer of total stock market cap than the strange, Fed-created input of “"Nonfinancial corporate business; corporate equities; liability, Level" (got that?) that the traditional Buffett Indicator employs. So why isn’t Buffett calling it like it is? Because he couches his language in conditionals. In January, he said the market wasn’t expensive “relative to interest rates.” Well, sure. At that time the Fed Rate was 1.25%-1.5%. So to parse his language, Warren Buffett was saying that for him, arguably the shrewdest and most savvy stock picker of the past 100 years, the stock market still looks like a pretty good bet compared to earning next to nothing via fixed income vehicles. But what if you’re not the Oracle of Omaha? Does the Buffett Indicator suggest to you that it’s a good time to add risk and buy stocks? Only if you think a valuation higher than immediately prior to both the dotcom meltdown and Great Recession represents a good deal and a smart ‘risk on’ buying opportunity. Here is a more transparent alternate snapshot over a shorter timeframe using the Wilshire 5000 Full Cap Price Index divided by GDP. We've used the St. Louis Federal Reserve's FRED repository as the source for the stock index numerator (WILL5000PRFC). The Wilshire Index is a more intuitive broad metric of the market than the Fed's rather esoteric "Nonfinancial corporate business; corporate equities; liability, Level". This Buffett variant is also at its interim high. In a February 27 interview with CNBC, Warren Buffet expressed his view that the stock market is "on the cheap side". His opinion seems to imply that buying into the market is inexpensive. 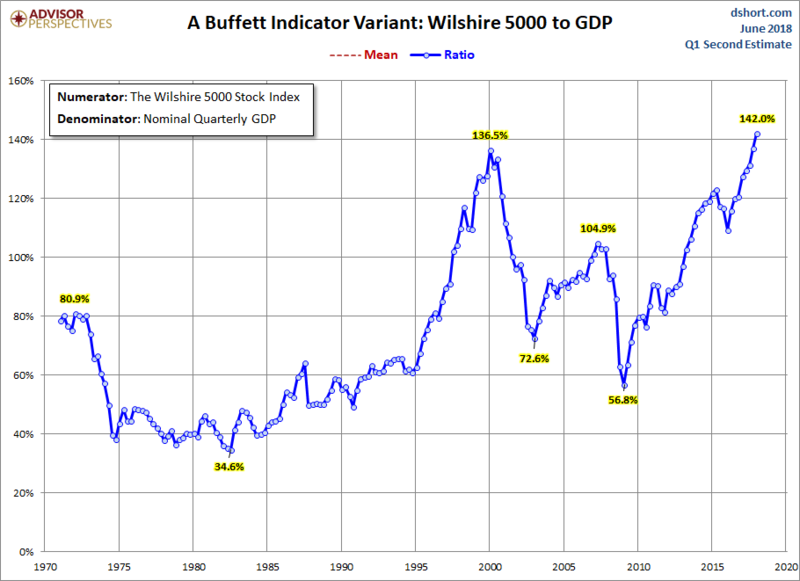 However, both the "Buffett Index" and the Wilshire 5000 variant suggest that today's market remains at lofty valuations.